Recently, my app was required to download 30,000 records during sync. I think that’s a lot of data for a phone app, but that’s the way our app is. The data were from a URL with data in JSON format. 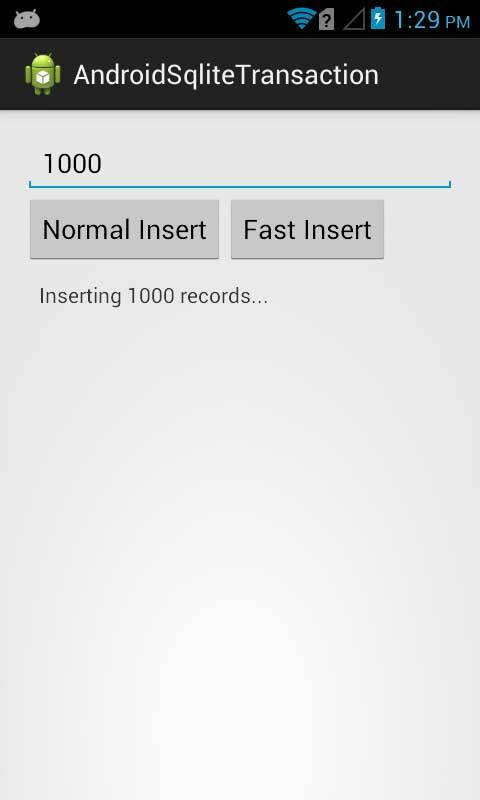 Our Android app has to read, parse and store the data on the device SQLite database. 30,000 records in one URL load is not advisable, we did several tests. I tried to parse it but failed, memory leaks occur, sometimes it was an out of memory error. So I tried some more test until I found the correct number of records per URL. 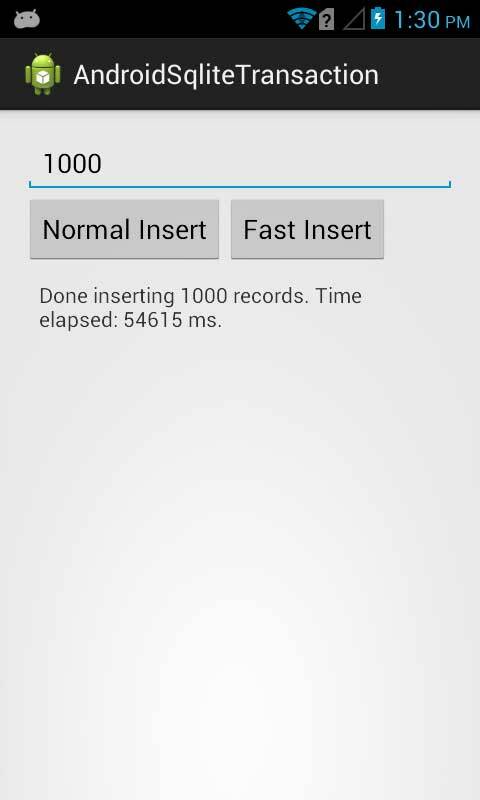 7,000 records and our app was able to read and parse it all. But to be safer, I made it to 5,000 records per page. We had to paginate the download, so in our case, we had 6 pages. 6 pages x 5,000 records = 30,000. So yeah, it was very effective. All records were downloaded and inserted to the device SQLite database. But before we were able to efficiently insert the records to the database, we run into the problem of “insert speed”. The usual insert command in Android is slow, so we had to use a transactionand prepared statement. In our case, we use INSERT OR REPLACE INTO on the insert query since we want to update a row if it already exists, based on the trigger (INDEX) created. Another important factor in speeding up your insert is using prepared statements. Our source code will have three main files, the MainActivity.java, DatabaseHandler.java and activity_main.xml. I made the code as simple as possible for this example to be clear and easy to follow. MainActivity.java – our program’s first run, it also contains the AsyncTask that will be executed when the user clicks a button. // we used AsyncTask so it won't block the UI thread during inserts. DatabaseHandler.java – handles the database operations such as table creation, emptying the database, counting database records and the inserting our data using a loop. // create the index for our INSERT OR REPLACE INTO statement. // this acts as the WHERE name="name input" AND description="description input"
// it will be REPLACEd. String INDEX = "CREATE UNIQUE INDEX locations_index ON "
* to start a transaction. Non-exclusive mode allows database file to be in readable by other threads executing queries. activity_main.xml – the layout so we can enter the desired number of records to be inserted, choose whether we want it to be a ‘normal’ or ‘fast’ insert, and the status of the operation. When you entered 1000 as number of records to be inserted and pressed either the “Normal Insert” or “Fast Insert” button. After inserting 1000 the “Normal Insert” way. After inserting 1000 the “Fast Insert” way. See the huge difference in insert speed? Inserting 1,000 records were from 54,615 milliseconds (almost 1 minute) down to 322 milliseconds! 1. Do not put a “log” inside a loop, it affects the program execution and slows down the performance. For instance, Log.v(TAG, “Record was created.”); was inside a loop where you also insert the data. 2. Do not instantiate an object or class inside a loop, that’s the worst. The “new” keywords will slow down the performance. For instance, ValueConverter valueConverter = new ValueConverter(); will make you lonely for the rest of your life if it was inside a loop where you also insert the data. If you have other thoughts or want to correct me, or something, please drop it in the comments section below. I’m willing to update this post for new information, ideas and tips that you can give. Thanks for reading this Android SQLite transaction example!